The Wisconsin Bill of Sale Forms are legal documents that will prove the sale and purchase of various items in the state of Wisconsin. These documents will provide information regarding the buyer and seller, as well, will provide important information regarding the change of ownership and identifiable information pertaining to the item(s) being sold. Some documents will require notarization. Boat Bill of Sale – This form will prove that a boat/vessel, has been legally sold and purchased and will show the change of ownership. General Bill of Sale – Use this form between private parties for the sale and purchase of personal property. Gun Bill of Sale – This document will be used to prove the legal sale, purchase, and change of ownership of a firearm in the state of Wisconsin. Vehicle Bill of Sale – Use this document to prove the legal sale and purchase of a motor vehicle. 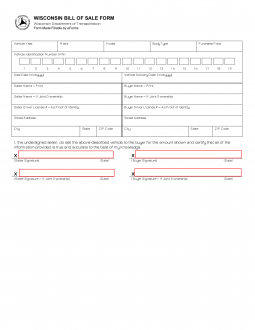 This form is likely to be used as part of the titling and registration process. Mail application with all applicable fees to the address on the application. Or, if you prefer, drop off the application and payment of fees (located on the Boat Registration form, at any DNR office. There is a fee schedule located on the Title/License Plate Application (Form MV1) to assist you in proper calculation of fees.